Over 1000 Slime Fighter air/oil separators are now flying worldwide. This unique design eliminates the requirement for a separate drain return line which allows installation in minutes instead of hours. The lack of a return line also eliminates a potential failure point. Slime Fighters do not require mounting to a baffle or to the firewall. All Slime Fighters mount in-line with the breather tube and, due to the location and angle of the canister, the oil drains back into the crankcase through the crankcase breather exit port. The end result is the easiest to install, lightest weight air oil separator with the fewest possible connections. The benefits are lower oil consumption and a clean belly. Flow bench testing shows that Slime Fighter separators offer the lowest back pressure of any of the popular air oil separators for experimental aircraft. 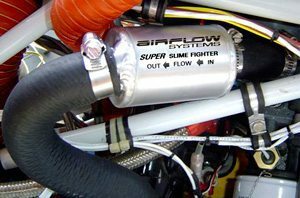 Airflow Systems now offers the Super Slime Fighter for large Lycoming engines as found in aircraft such as the RV-1 0, Glassair III and the F1 Rocket. Designed with ease of installation in mind, the unit installs in 30 minutes with no additional drain line required. Instructions, clamps and hoses are included. The air cooled engines found in most aircraft operate over a wide temperature range when compared to the typical liquid cooled engine found in most automobiles. In order to operate properly at the upper end of the temperature range, the clearance between pistons and cylinders in aircraft engines is greater than the clearance found on liquid cool engines. A frequent byproduct of this greater clearance is more crankcase “blowby.” Blowby is the mixture of oil and air that exits the crankcase vent tube and covers the bottom of your aircraft with an oily film. Air oil separators have been used on aircraft engines for many years. An air oil separator is typically a canister with an inlet from the crankcase breather tube, baffles inside the canister to collect and condense (separate) the oil from the air, an exit for the cleaned air, and a drain to return the collected oil back to the crankcase. This style of separator is often mounted to the firewall or rear engine baffle and drains into a dedicated entrance to the engine that must be drilled and tapped into the crankcase. The unique design of the Slime Fighter eliminates this extra return line allowing for a lighter, simpler installation.